$1,079.99 Seen a lower price? The sound quality of KORG synthesizers is endorsed by top-ranking musicians around the world. The evolved Korg KROSS 2 88-key Keyboard Synthesizer Workstation expands polyphony from 80 to 120 voices, and dramatically powers-up the number of internal programs from 809 to 1,075 programs. Including multi-layered pianos and electric pianos, thick strings and other new sounds that will work well with any band, as well as the latest drum kits to cover current styles such as EDM. The wide selection of programs covers your needs from live performance to studio production. The KROSS 2 now provides 128 MB of built-in expansion PCM memory. By selecting from optional libraries that will be released following KROSS 2, you can expand KROSS 2's internal sounds to meet the needs of your performing style or situation. The high-quality EDS-i Enhanced Definition Synthesis-integrated sound engine is inherited from KORG's professional synthesizers. You can use a total of seven effects units simultaneously: five insert and two master. Rich expressive power is available from the selection of 134 high-quality effects, including standard effects such as delay and reverb as well as amp modeling, vintage effect units, and even a vocoder. 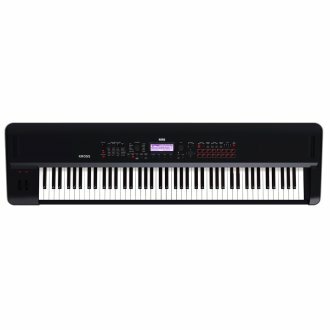 Height: 5.35" Width: 57.01" Depth: 15.08"
-- Note: The NH keyboard delivers a playing feel similar to that of an acoustic piano, with low notes being heavier and high notes being lighter. - Oscillator: OSC1 (Single), OSC1+2 (Double): Stereo multisamples are supported 4 velocity zones per oscillator, with switching, crossfades and layers. - Stereo and mono drumsamples. 4-way velocity switches with crossfades and adjustable crossfade shapes (Linear, Power, Layer). - 5 Insert Effects In-line processing; stereo in - stereo out. - 2 Master Effects Two effects sends; stereo in - stereo out.